While visiting the Grand Canyon, we had the pleasure of meeting Harry. He has spent his life as a rancher, or as I prefer, a cowboy, working the ranches of the Southwest. 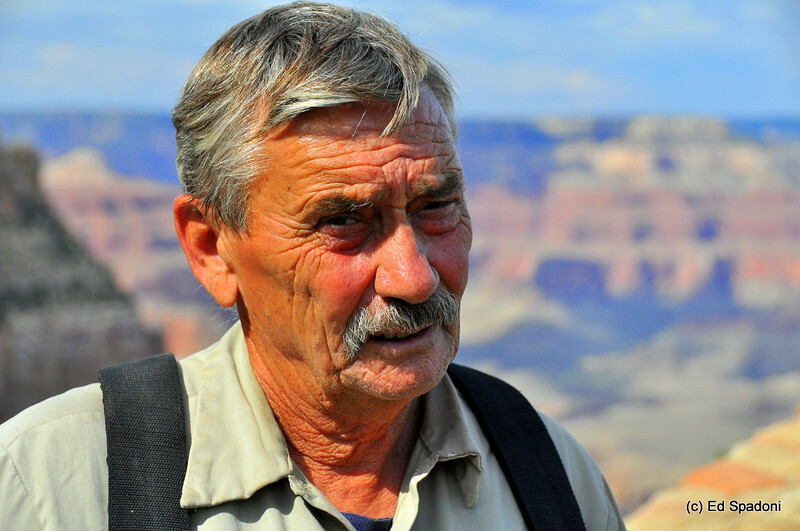 The ranch he had worked at for the past 12 years had closed due to the economy and he now works at Grand Canyon Village. After chatting with Harry a while, I asked if he'd mind if I took his picture. He seemed surprised that anyone would want to do that, but said "Well sure, if you want to." I think this image captures the character of this man, and reflects the ruggedness of the geography and profession in which he has spent his life. We saw Harry again a few times during our visit, and he always gave us a warm smile and a friendly wave. Meeting Harry was one of the many highpoints of our trip. This is an excellent portrait Ed. The wrinkles on his face seem to tell a story- great comp too. Superb portrait of Harry. Would like to hear some of his "cowboy" stories, I'll bet he has a few! A great character study, Ed. Outstanding shot, but I'd like to see your face, too.